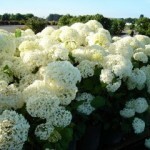 A rounded shrub with enormous, round clusters of sterile, white flowers. It blooms June through September. 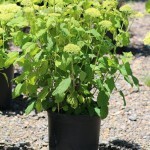 The summer foliage is dark green, and softer than the mophead hydrangeas. Prefers part shade but will take full sun if provided with sufficient moisture. The large blooms appreciate some support or mass planting for the best display. It flowers on new wood, something to consider when pruning this variety.